Clare Sestanovich is a researcher and contributes to daily news coverage at The Marshal Project. Previously, she was an editorial fellow at The Atlantic and graduated from Yale University in 2013 with a degree in English. 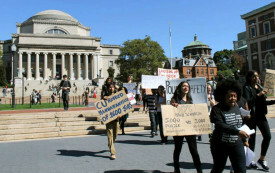 Columbia Students to Lee Bollinger: Divest From Prisons Now! As of last year, the university had $8 million invested in Corrections Corporation of America, as well as shares in other private security firms.